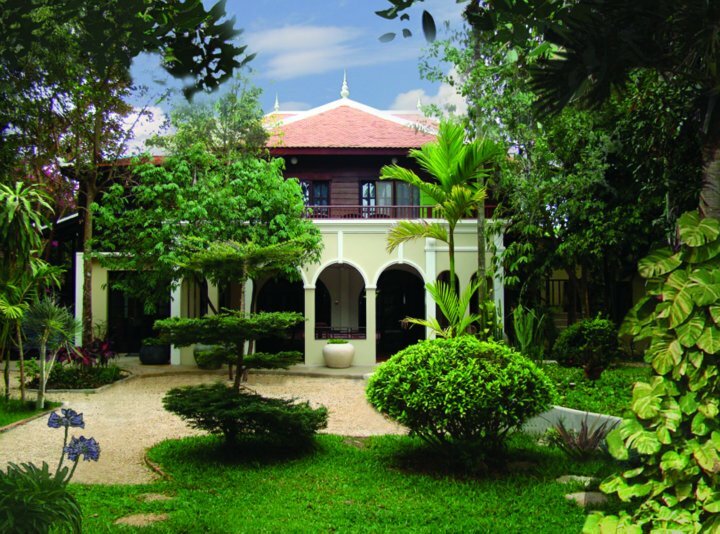 "A chic haven of rest an relaxation": Naomi Lindt is full of admiration in 36 Hours in Siem Reap, published by nytimes.com. 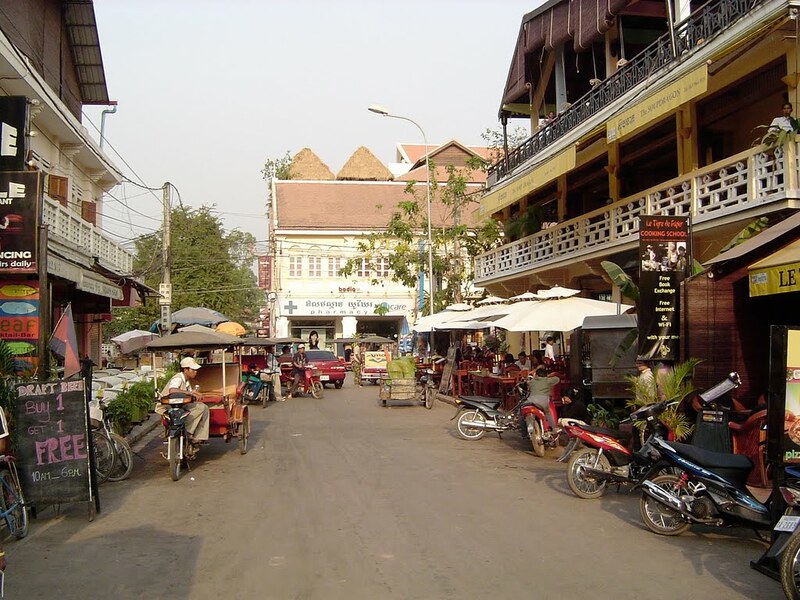 The Town has developped from a cluster of small villages along the Siem Reap River, which meets the Tonle Sap Lake in the South. 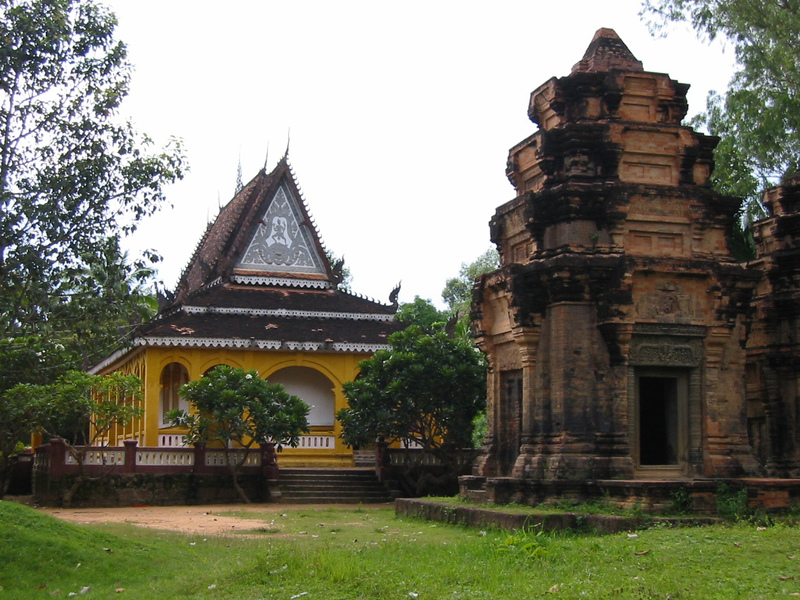 Along the river you find Buddhist Pagodas (Wats) as centres of the villages, from Wat Preah En Kau Sei in the North to Wat Phnom Krom in the South. ... Pub Street in the night. The main town with old colonial and chinese style architecture is concentrated around Sivutha Street and the Psar Chas (Old Market) area. 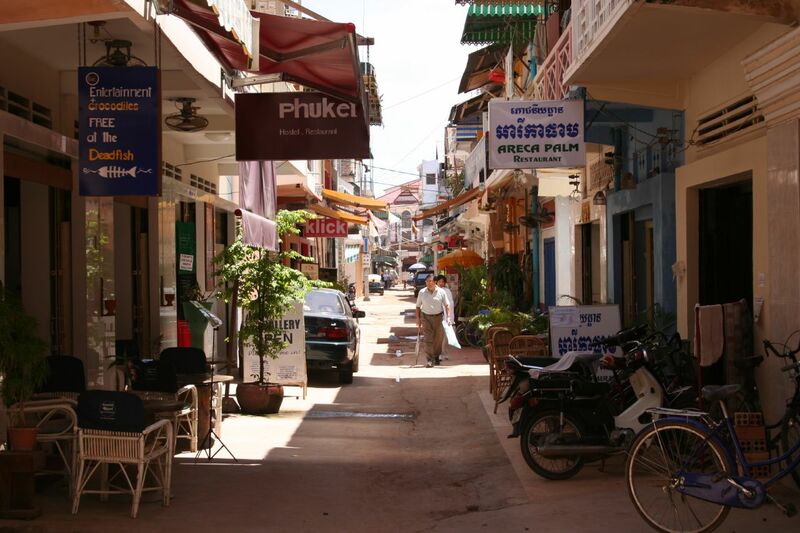 The Wat Bo area is full of guesthouses and restaurants while the Psar Leu area is crowded with jewellery and handicraft shops. 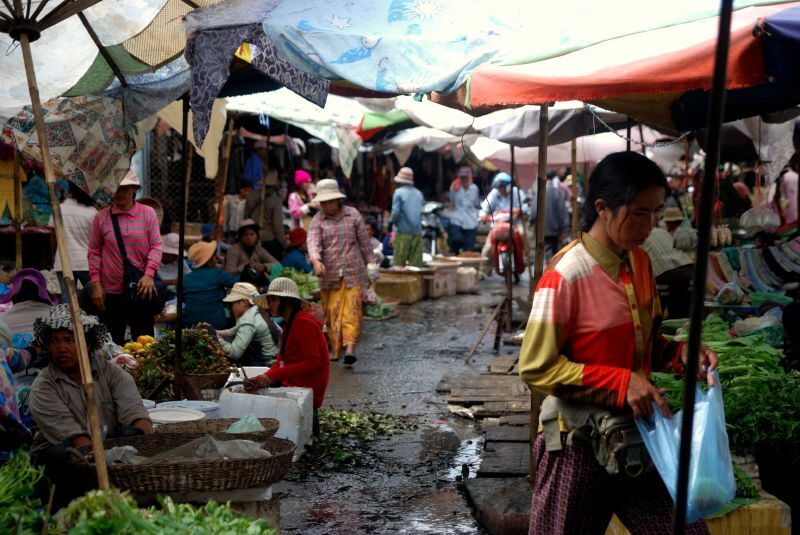 The word Phsar means Market, Leu means Upper. It is located about 2 km from Siem Reap, on the right side of National Road 6 when travelling from west to east. 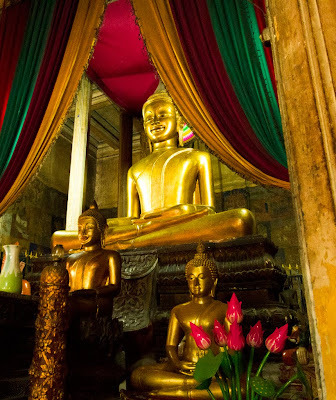 You should not miss the traditional Apsara dance performances. 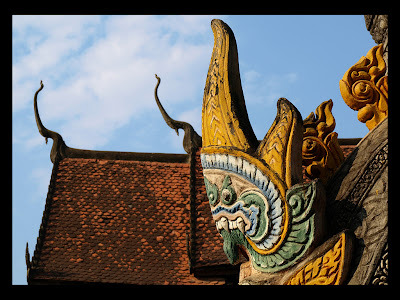 Many hotels show them, but there is also the Apsara Theatre, an elegant wooden performance hall. 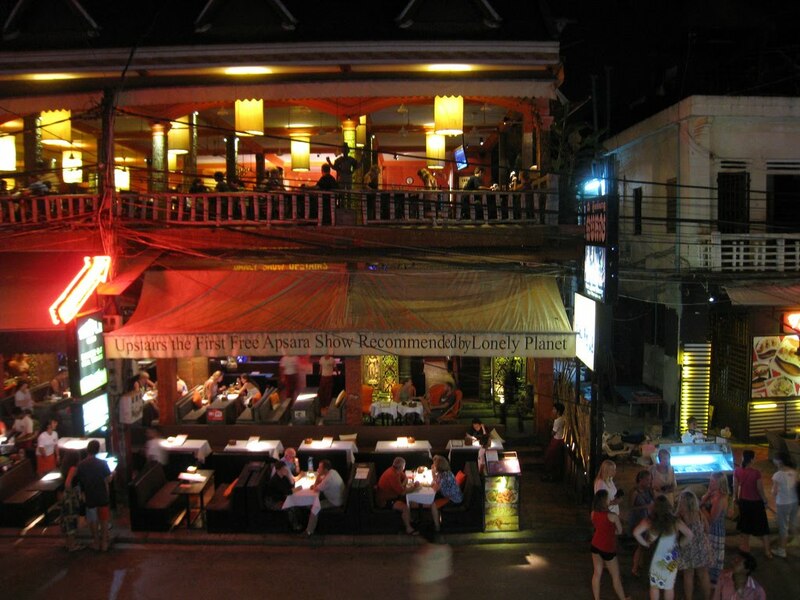 Read more about The best dance performances in Siem Reap. Dancer of the Apsara ballet in l'Amazon Angkor Restaurant. Art Deli: Housed in a 1920’s French colonial building in the Alley West, the ArtDeli is a gallery, library, café-bar, and an alternative performance venue. 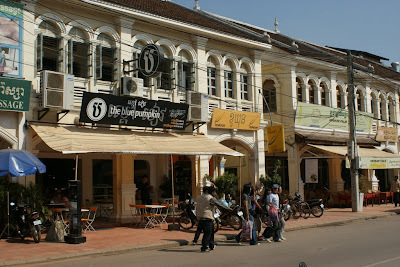 It serves Italian cuisine and organic meals by Trattoria Pizzeria and the Singing Tree Café next door. McDermott Gallery: Two exhibitions, one in FCC Complex at Pokambor Avenue, the other one lies in the passage between Pub Street and the Old Market. 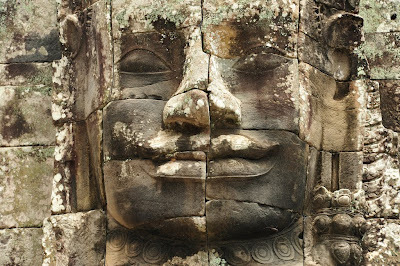 In FCC John McDermott shows his own work, pictures of the temples of Angkor, that "are not just beautiful but iconic. Dreamlike photos, which look as though they were taken in an ancient, forgotten world", wrote the New York Times. Red Callery: FCC-Complex. 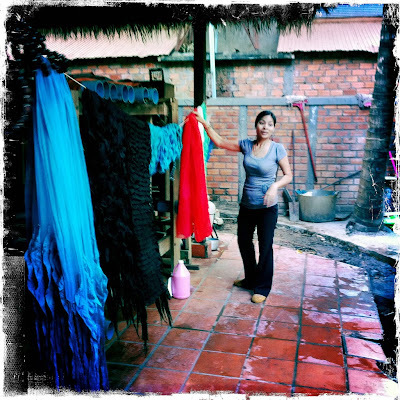 The British Artist, Teacher and Art Project Coordinator Sasha Constable, living in Cambodia since 2000 shows here her own work. 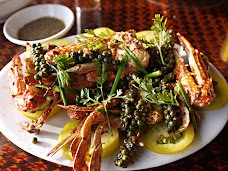 Theam's House: No.25, Phum Veal. Located on the main road to Angkor Temple, Atelier and Art Studio. 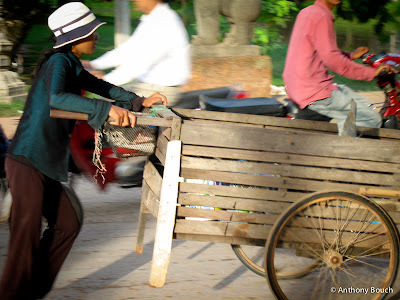 For more than 10 years artistic director of Artisans d’Angkor, now Lim Muy Theam has launched a new project that includes training a team of artisans apprentices. And he continues with his own painting. In the gallery you discover paintings, ceramics, wood carvings, and more. Read the reviews on tripadvisor.com and the article Lacquered elephants and bald Buddhas rule at Theam’s House by Miranda Glasser on phnomphenhpost.com. Open daily from 8am to 7pm. The Arts Lounge: Hotel de la Paix. 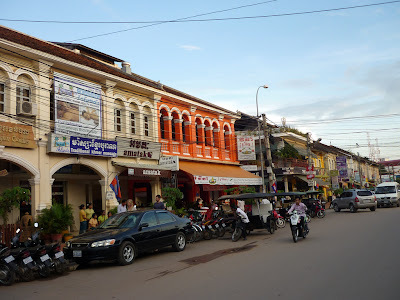 "Exhibitions with an emphasis on Cambodian artists and international artists with a strong connection to Cambodia", notes travelfish.org. And a bar with DJs. 1961: Osaphear Street. 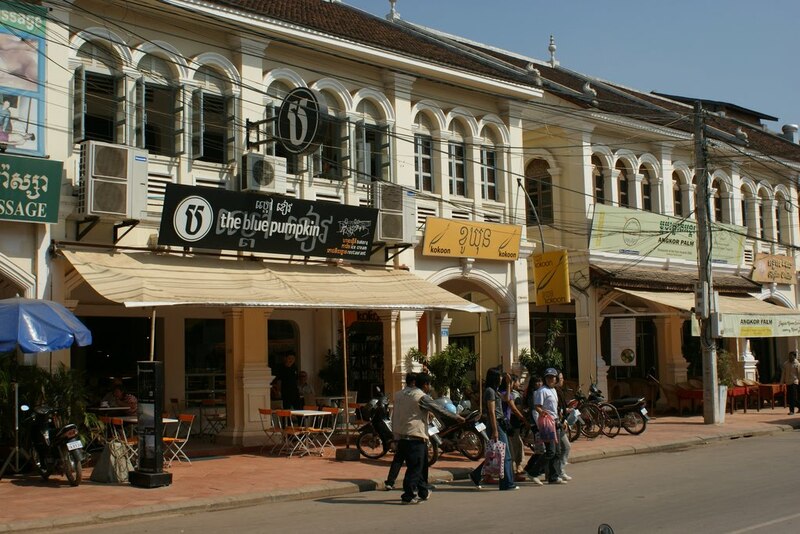 An art center comprising of a series of galleries, boutiques, food & dining outlets and an 8-room hotel. 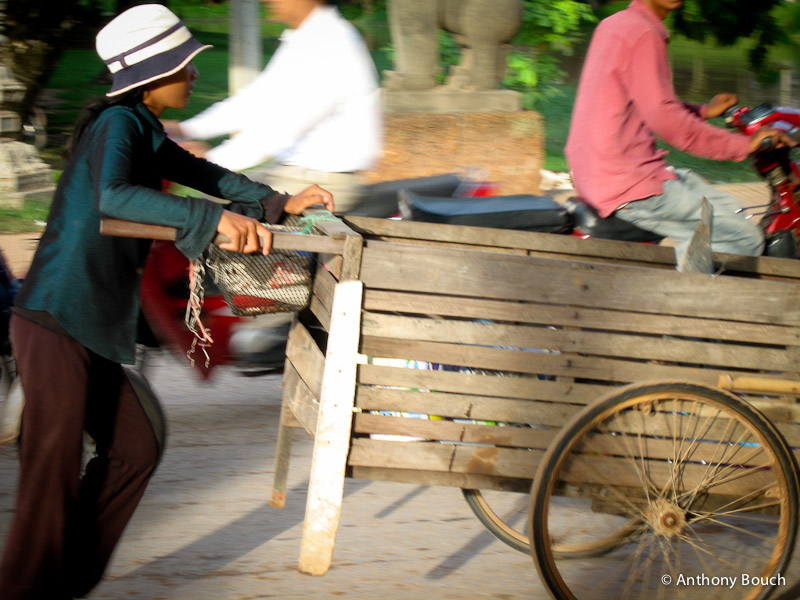 Artisans d'Angkor: Artisans Angkor is a company which was originally created to help young rural people find work near their home village. Since its creation at the end of 1990s, Artisans Angkor has strived to offer good working conditions and social advantages to its employees. It has now opened 42 workshops in Siem Reap province and it provides employment to over 1300 people, including more than 900 artisans. The company offers silk fabrics and garments, stone and wood carving, lacquer ware, polychrome products, silver plating and silk painting. Eric Raisina Villa Boutique Workshop: Heard of Eric Raisina? Yves Saint Laurent, Christian Lacroix, Jean Paul Gaultier and Issey Miyake are some of the fashion brands that get fabrics from him. 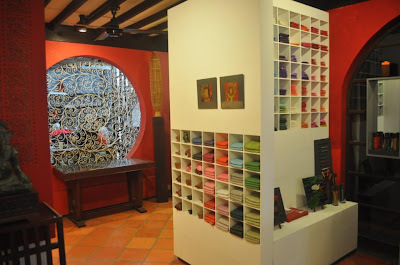 "No words can describe the things that this Madagascar-born and - since 2002 - Siem Reap-based designer can do with silk", notes anothertravelguide.com. 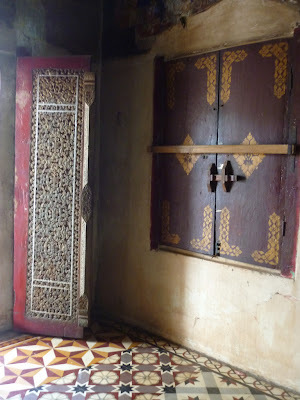 "Although things designed by Eric Raisina can be obtained in the Heritage Hotel and Amansara shops, a visit to his own showroom in Siem Reap is a must; it is located in Raisina's house, not quite in the centre of the city." See pictures of the atelier on fuchsiaboy.blogspot.com. Eric Raisina's choice of Siem Reap was not accidental. Siem Reap is only ten miles away from the Puok District, which has a tradition of silk production dating back to the 13th century. "Eric Raisina insists that his fabrics must be touched and felt. That helps to better appreciate their distinctive texture", writes Roman Poroshyn. See video Luxe dans les détails. 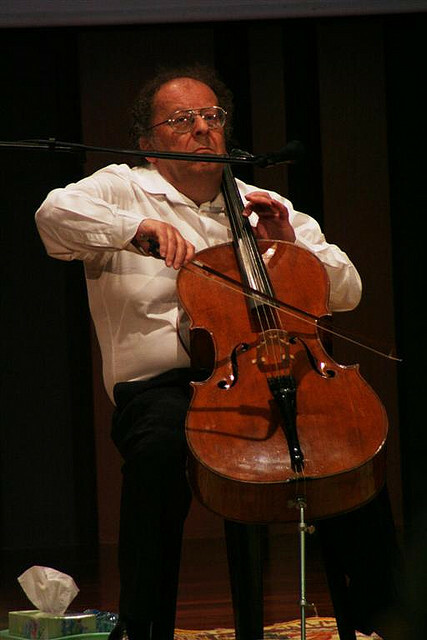 And read an interview with Eric Raisina. Poetry: The Lane. 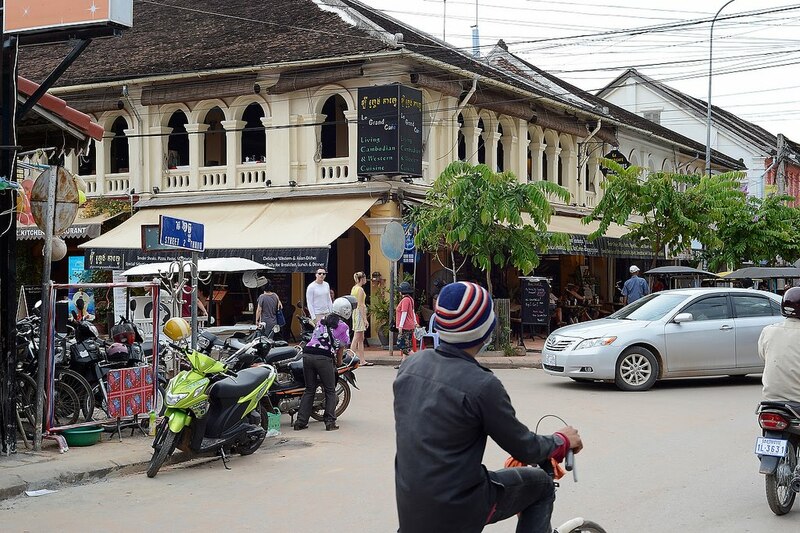 Filipino fashon designer Don Protasio has been living in Siem Reap for six years, as Destination Asia tells us. He does a line under his name, but also PAID, a line from recycled fabrics. See him posing in Siem Reap. Follow his blog Fuchsiaboy. He startet the shop Petry with Hotel 1961 owner Loven Ramos. 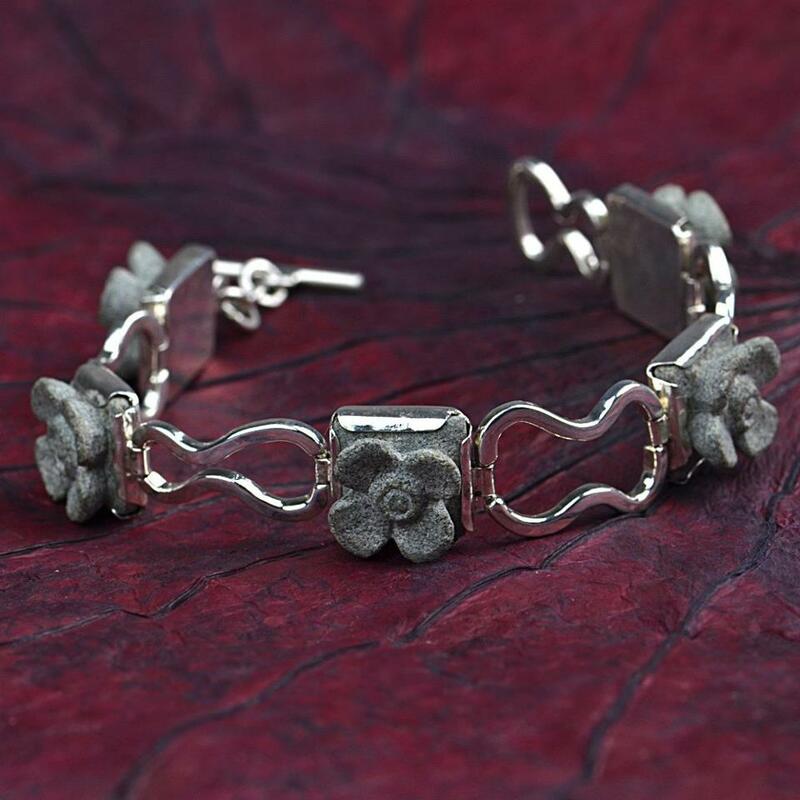 Garden of Desire: The jewellery store of Cambodian Pisith Ly, who makes jewellery from precious gems, quality metals and natural materials, like stone and wood. Pisith fled Cambodia as a young child after the Khmer Rouge murdered his family and moved to Paris, where he studied fine arts and designed for Alain Mikli and Phillipe Starck. He returned to Siem Reap. Read his story on Phnom Penh Post. Wanderlust: Alley West. 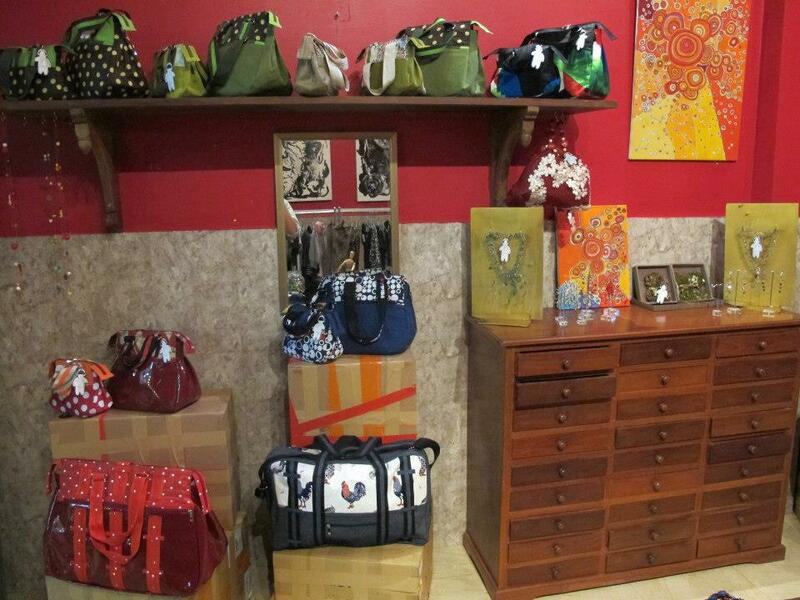 Wanderlust, a boutique founded by Elizabeth Kiester, the founder and former chief creative director of LeSportsac. 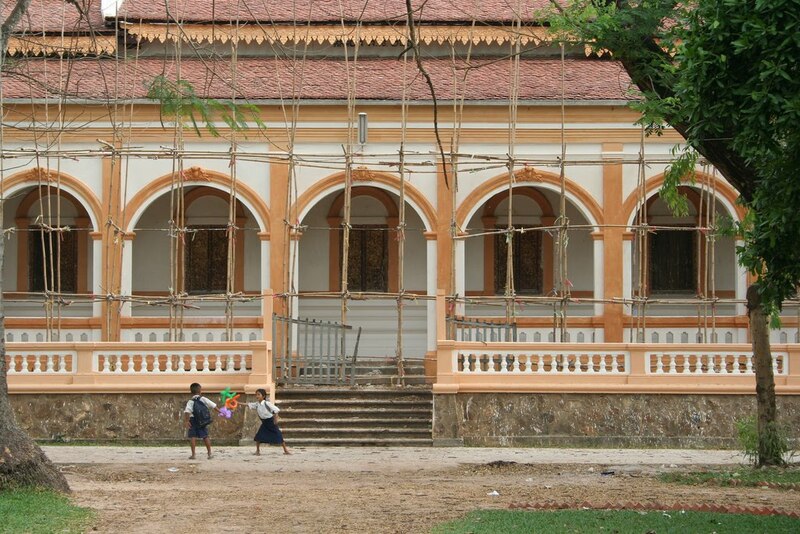 who came to Cambodia in 2008 and decided to stay. But she has left the company two years ago. Scams with gems: Be careful with shopping gems in Siem Reap. There are a lot of stories about scams. For example babygirl0 was not pleased with the service of City Gems, her comment on fodors.com. 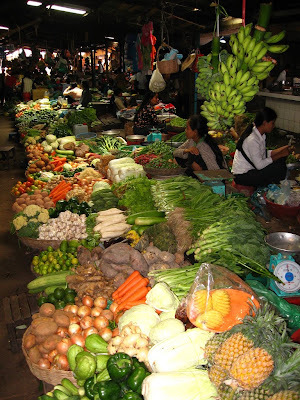 Find an overview of shops in Siem Reap. 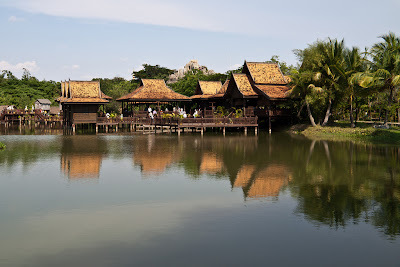 Cambodian Cultural Village is “Cambodia in miniature” in Siem Reap shows the rich natural and cultural heritage of the Khmer people. 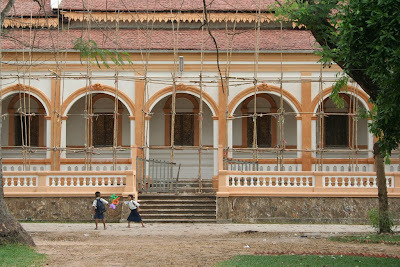 Inside you find representations of Cambodia’s 11 Villages, houses of different architectural styles. 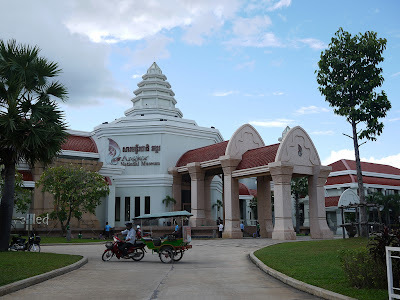 At each village there are traditional dance performances, traditional wedding ceremonies, performance of ethnic minorities, Apsara Dancing, Circus, Acrobatic, popular games and the Grand Khmer Family white Night Shows. Wax museum exhibits the development of Cambodian Culture from the first century up to present. See show performaces. 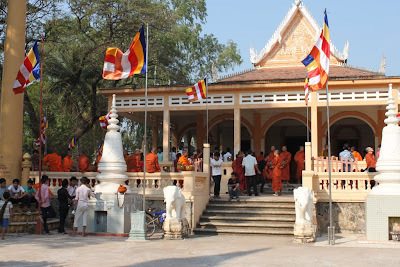 Wat Bo: One of the oldest Buddhist monasteries in Siem Reap. 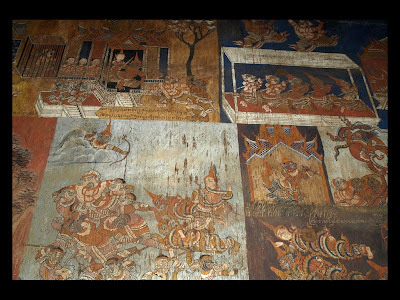 Built in the 18th century, the pagoda has an epic Khmer poem painted on its wall, based on India’s Ramayana called Reamker (see pictures). 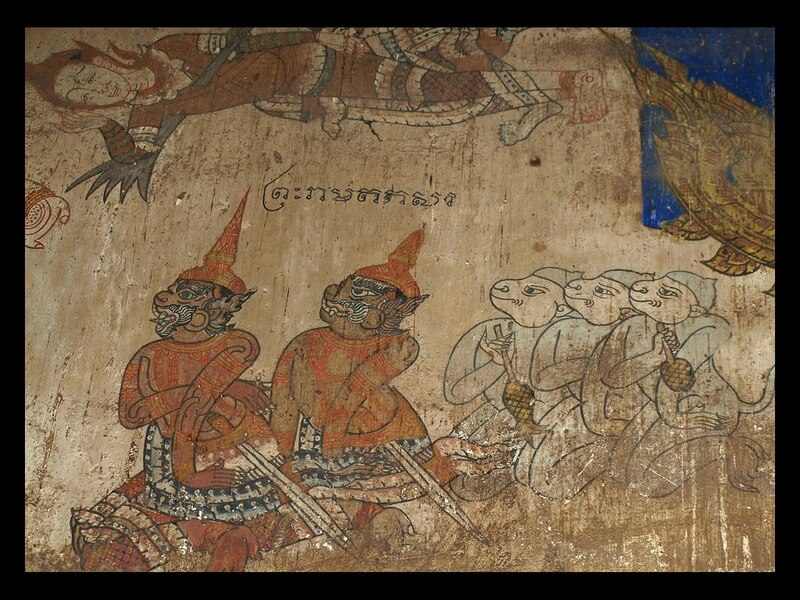 According to Andy Brouwer they date from 1920-1924 and were executed by two shadow puppet designers, Ta Peul and Kong Dith, though some claim it may've been earlier. You can also see 19th century paintings depicting Siem Reap’s daily life under the French on the interior walls of the vihear. 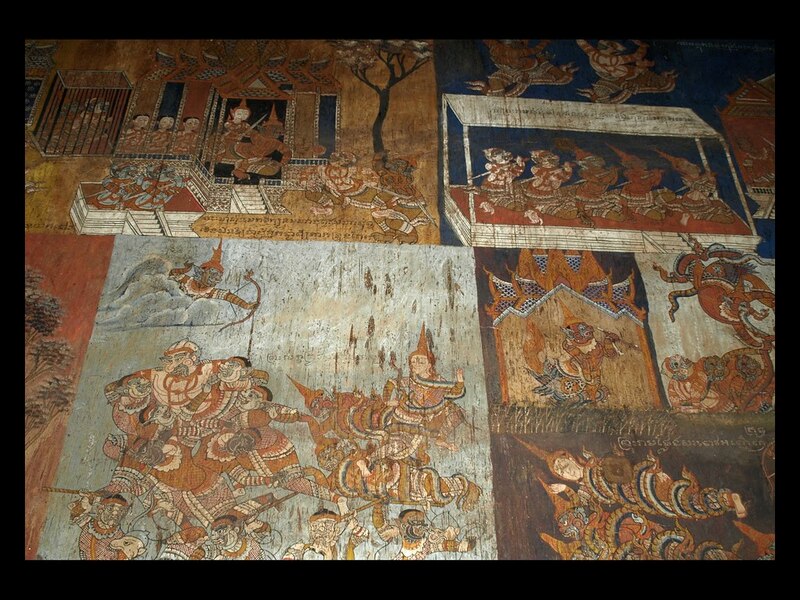 Wat Bo is also a place, where archaeological and art objects are kept. 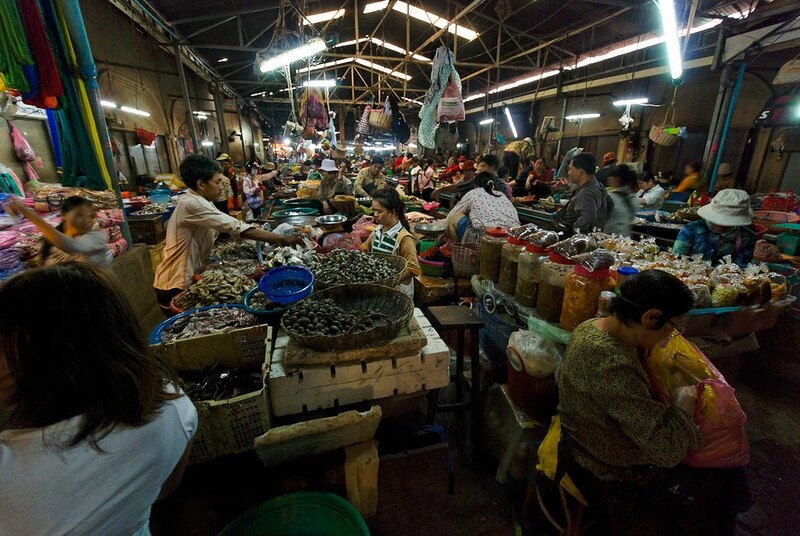 It was monk Pin Sem's desire to prevent them from export abroad. He first started to collect the treasure in 1986-87, when he had been hiding from the Khmer Rouge at the Cambodian-Thailand border, where Khmer treasures were being sold to Thailand. He bought the objects from the sellers and preserved them. Thousands of objects are housed at the monastery: statues, utensils, jewelries, musical instruments, ceramics and human skeletons, dating from prehistoric times to the present day. There is now a database called Wat Bo Earthern Ware Ceramics, created by members of the University of Sydney (read more in the book Water Civilization: From Yangtze to Khmer Civilizations. The 5oo ceramics were found at Phum Snay area of Banteay Meanchey Province in Cambodia. More background here. 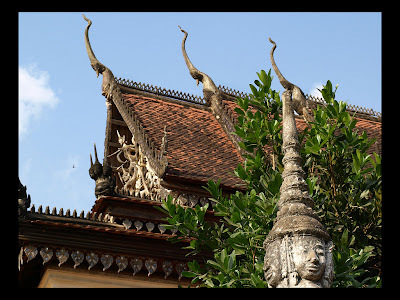 Wat Damnak: The name Dam Nak stands for palace - here used to be the a royal palace during the reign of King Sisowath. Today you find here a temple with schools and a very nice garden as well as the the Centre for Khmer Studies with a large library..
Every Saturday, at 7.15 pm and sometimes also every Thursday at 7.15 pm: Swiss doctor Beat Richner he calls himself Beatocello - plays Bach on the cello and speaks about the activities of his four children's hospitals in Cambodia. And he shows a film about 20 years of work for justice in Cambodia. Justice? Yes, read more here. 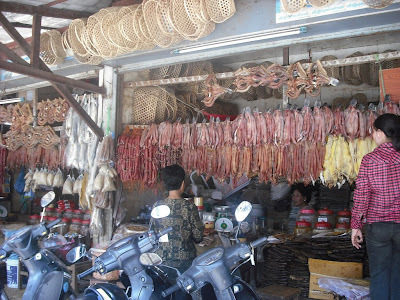 The wildlife and biodiversity in Cambodia is endangered for example by illegal wildlife trade - and the Angkor Centre for Conservation of Biodiversity (ACCB) aims to protect them. It is the first nature conservation centre in Cambodia. 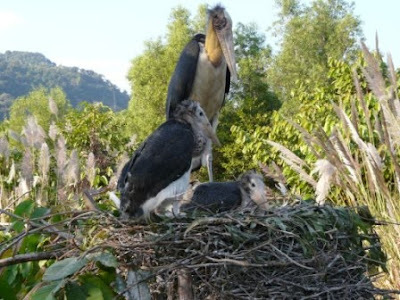 And it rescues wild animals, breeds endangered species and works for environmental education. At the centre actually live Pileated Gibbon (Hylobates pileatus), Silvered Langur (Trachypithecus germaini), Northern Slow Loris or Bengal Loris (Nycticebus bengalensis), Malayan Pangolin (Manis javanica), Asian Palm Civet (Paradoxurus herma­phroditus), Leopard cat (Prionailurus bengalensis), a wild boar, two Malayan Porcupines and one Pig-tailed Macaque, birds, snakes and turtles. ACCB is upported bei Münster Zoo in Germany. Read more about the animals. 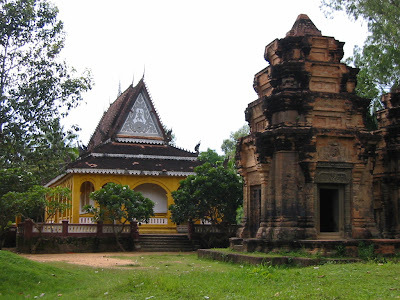 The ACCB is open to guided tours and located at the site of Kbal Spean, 12 km north of Banteay Srey. You find the gate next to the car park. Regular guided tours are offered Monday to Saturday at 13 pm, they last around 1 hour 30 minutes and require a minimum donation of 3 USD. During the tour you can see a variety of animals and learn first hand about efforts to save Cambodia’s wildlife. If you have a valid temple pass you can also see the waterfall and riverbed carvings at Kbal Spean. Read more about ACCB tours. Bangkok Airways offer several daily flights to/from Bangkok, Chiang Mai, Lampang and Trat. 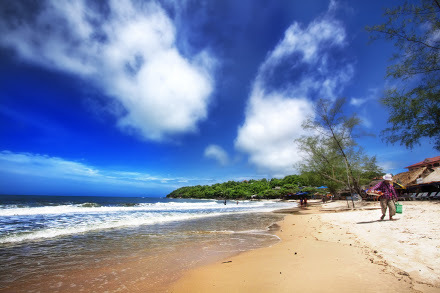 Now Cambodia national carrier Cambodia Angkor Air (CAA) officially confirmed to operate a daily flight from Siem Reap to Bangkok, starting November 30. 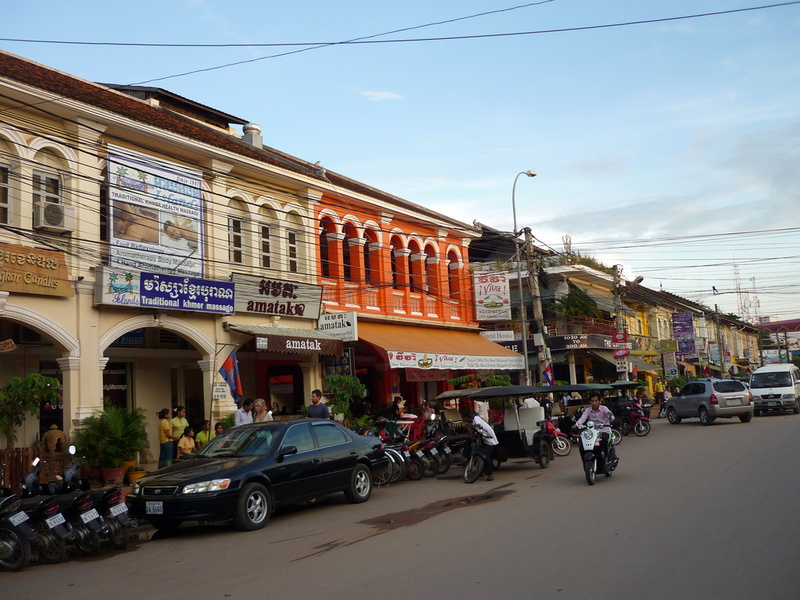 Lao Airlines has flights to and from Luang Prabang, Pakse and Vientina. Vietnam Airlines flies to and from Hanoi and Ho Chi Minh City. Air Asia flies to and from Kuala Lumpur. Cambodia Angkor Air flies to and from Phnom Penh. Singapore Airlines to and from Singapore. Korean Air flies to and from Seoul. 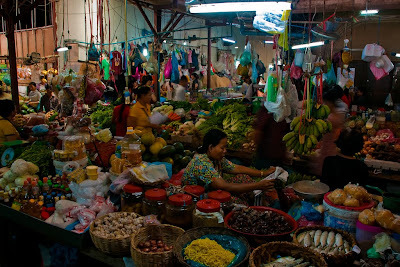 Myanmar Airways International flies on Wednesdays and Saturdays to Rangoon. 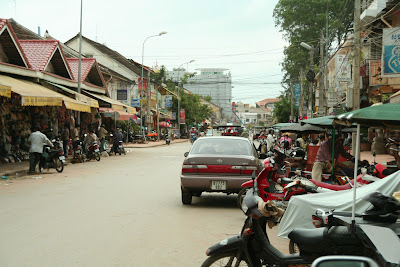 More ways of getting to Siem Reap on canbypublications.com. Bus-Schedules here.